In some ways, the 1980-81 NHL season was a continuation of the previous campaign. The New York Islanders built on their 1980 championship, while a baby-faced Wayne Gretzky, in just his second NHL season, upped his scoring production to previously unseen levels. Exciting newcomers Denis Savard, Dino Ciccarelli and 1980 U.S. Olympian Neal Broten flashed onto the scene in '80-81, while aging legends including Jean Ratelle took their final twirls around the League. In our second installment on the high-scoring decade of the 1980s, I’ll look back on some of the top memories and moments from the '80-81 season. Was the 1992-93 NHL season the greatest ever? After eight so-so seasons in Atlanta, where the Flames never won a playoff series despite qualifying for the Stanley Cup chase six times, the team was sold and relocated to Calgary, Alberta, prior to the '80-81 campaign. The new owners kept the franchise nickname, which remains to this day. In that first season in Calgary, despite moving from the Eastern to Mountain time zone, the Flames remained in the Patrick Division, alongside the Northeast corridor foursome of the New York Rangers, New York Islanders, Philadelphia Flyers and Washington Capitals. Kent Nilsson certainly enjoyed the trip to Western Canada. The smooth Swede, who started his North American career with Winnipeg of the WHA in 1977, finished third in League scoring with a career-best 131 points, still a single-season franchise record. Nilsson’s 82 assists also remains the team’s single-season standard. The move certainly changed the Flames' playoff luck. They entered the 16-team postseason tournament as the seventh seed, matched against the 10th-seeded Chicago Blackhawks. Coach Al MacNeil’s club swept the Hawks in an opening-round, best-of-5 series for the franchise’s first playoff series victory. The Flames doubled that total by eliminating the Flyers with a 4-1 Game 7 triumph in Philadelphia. Their first deep playoff run ended in the semifinals, when they fell to the Minnesota North Stars in six games. Al Arbour’s Islanders roared to their second straight Stanley Cup, defeating the surprising North Stars in a five-game Final. Goalie Billy Smith backstopped the championship run and center Butch Goring won the Conn Smythe Trophy as playoff MVP. The Islanders had rolled through the regular season, finishing with a league-best 110 points. In the playoffs, outside of a slight scare from Gretzky and the baby-faced Oilers in the second round (the Islanders advanced in six games), Denis Potvin and Co. went a dominant 15-3 en route to the second title in the short nine-year history of the franchise. Entering the '80-81 season, Montreal Canadiens icon Maurice Richard was the only skater in NHL history to compile 50 goals in the first 50 games of a season. The “Rocket” did it during 1944-45, when the regular season was 50 games. As the '80-81 season rolled into January, the Islanders’ Mike Bossy and the Los Angeles Kings’ Charlie Simmer were poised to challenge the legendary goal-scoring accomplishment. On Jan. 24, 1981, in the Islanders’ 50th game of the season, Bossy was able to score a pair of goals against Quebec in the final 5:15 of regulation (the five-minute overtime period had not yet been introduced) to match the Rocket. The historic marker came with 1:29 left on the clock. Bossy finished the season with 68 goals in 79 games, one goal shy of his career single-season high. The Islanders’ sharpshooter is the only man in NHL history to record nine consecutive 50-goal seasons. There was no sophomore slump for Wayne Gretzky, who enjoyed a record-setting campaign in '80-81. During the 80-game season, the Great One established a single-season scoring mark, piling up 164 points to break the previous record of 152, set by Phil Esposito, 1970-71, en route to the first of seven consecutive Art Ross trophies. Gretzky’s 109 assists smashed the single-season mark in that statistical category too. A fellow by the name of Bobby Orr had set the previous record with 102 assists in '70-71. 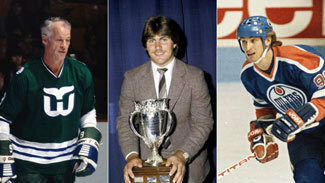 For his efforts, 20-year-old Gretzky was awarded the second of his eight straight Hart trophies. And, as we know, No. 99 was just getting started with his rewriting of the record book. On April 8, 1981, the opening night of his second NHL postseason, Gretzky became the sixth player in NHL history to dish out five assists in a single Stanley Cup Playoff game, during a 6-3 Game 1 win over the Canadiens at the fabled Forum. Previously, only Montreal’s Toe Blake, Maurice Richard and Bert Olmstead, Boston’s Don McKenney and Chicago’s Stan Mikita had accomplished the feat. The Oilers swept the Habs in their best-of-5 opening round series before falling to the Islanders in the second round. In nine playoff games, Gretzky finished with seven goals and 14 assists for 21 points. After defecting from Czechoslovakia with his brother Anton, international hockey sensation Peter Stastny didn’t take long to make his mark on the NHL. In his first season, Stastny scored 39 goals and dished out 70 assists for a total of 109 points, becoming the first NHL rookie to crack the century mark. The previous year, in his first NHL season, Gretzky had topped the 100-point plateau, but he wasn’t technically a rookie because he’d played professionally in the WHA. For his efforts, Stastny was awarded the Calder Trophy, beating out Kings defenseman Larry Murphy. In the end, both guys did pretty well for themselves, each earning induction to the Hall of Fame. These days, Red Berenson is best known as the legendary coach of the Michigan Wolverines. Before first stepping behind the bench in Ann Arbor in 1984, however, Berenson cut his coaching teeth in the NHL. In 1978, after a distinguished playing career that lasted nearly 1,000 NHL games, Berenson retired and accepted an assistant coaching position with the St. Louis Blues. A year later, he graduated to the top job. 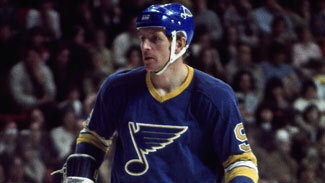 In '80-81, his second season, the Blues finished with 107 points, an improvement of 27 over the previous year. In the playoffs, the second-seeded Blues advanced past the Pittsburgh Penguins in an unexpectedly difficult best-of-5 series. In round two, they weren’t as fortunate, losing to the upstart Rangers. Still, Berenson earned the Jack Adams Award for his outstanding work. Eventually, the call to return to Michigan -- his alma mater -- was too great. Like Berenson, Randy Carlyle is best known for something much different in today’s hockey circles. In 2007, Carlyle led the Anaheim Ducks to their first Stanley Cup. These days, he’s trying to turn around the fortunes of the Toronto Maple Leafs. But in '80-81, Carlyle was still in the early stages of a playing career that would see him skate in 1,055 regular-season games during 17 seasons. At that time, as a fixture on the Penguins' blue line, Carlyle was critical in jumpstarting their attack from the back. In 76 games, he put up a career-best 83 points, helping him earn Norris Trophy honors, outpolling Islanders star Denis Potvin. The pieces of what would become a dynasty team continued to come together in Edmonton. During the '80-81 season, future Hall of Famers Jari Kurri, Paul Coffey and Glenn Anderson all made their professional debuts for the Oilers. Talk about getting better fast, eh? Kurri had the most immediate impact. Playing alongside Gretzky, the Finnish sniper scored 32 goals and added 43 assists for 75 points in as many games. Kurri finished second in team scoring, a mere 89 points behind Gretzky. Anderson also enjoyed a strong rookie season with 30 goals and 53 points in 58 games, while Coffey contributed nine goals and 23 assists from the blue line in 74 games. While budding superstars were blossoming in Edmonton, some of the game’s legendary players took their final bows during the '80-81 season. Most notably, 38-year-old Phil Esposito closed out a Hall of Fame career, playing in 41 games for the Rangers. At the time of his retirement, Esposito was second on the all-time goal-scoring list with 717, trailing only Gordie Howe. Espo is among an elite group of six players to score more than 700 NHL goals. The "700 club" includes Gretzky, Howe, Brett Hull, Marcel Dionne and Mike Gartner. With 1,590 career points, Esposito still stands 10th on the all-time points list. Later, in the early 1990s, he’d impact the game in a different way, playing a vital role in bringing an NHL franchise to Tampa, Fla.